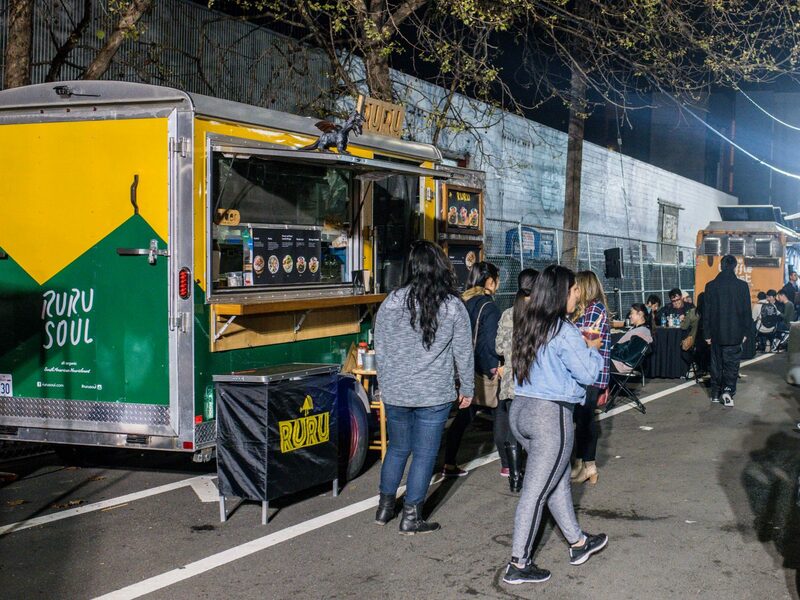 The Bay Area’s First Noods Noods Noods Festival! What’s up, Nomsters! 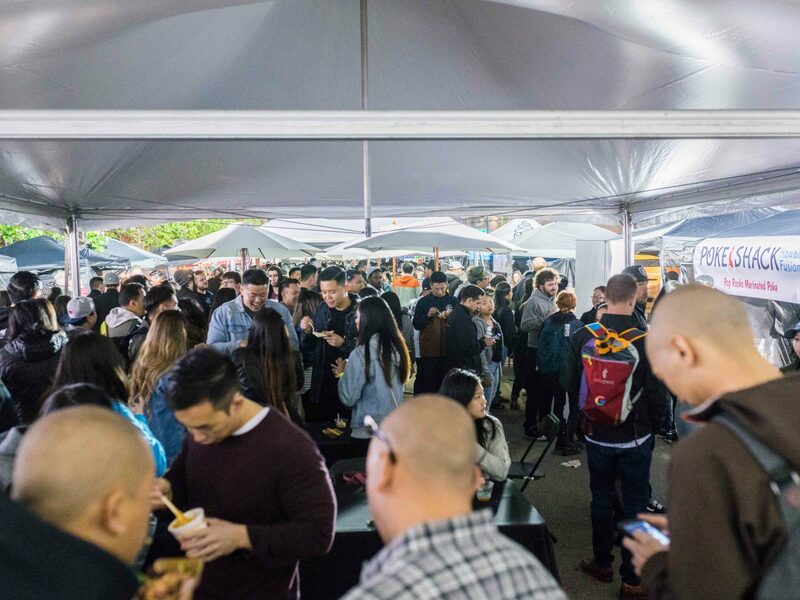 Today we’re super excited to recap our awesome experience at the first Bay Area Noods Noods Noods noodle festival put on by foodbeast in Oakland, CA! 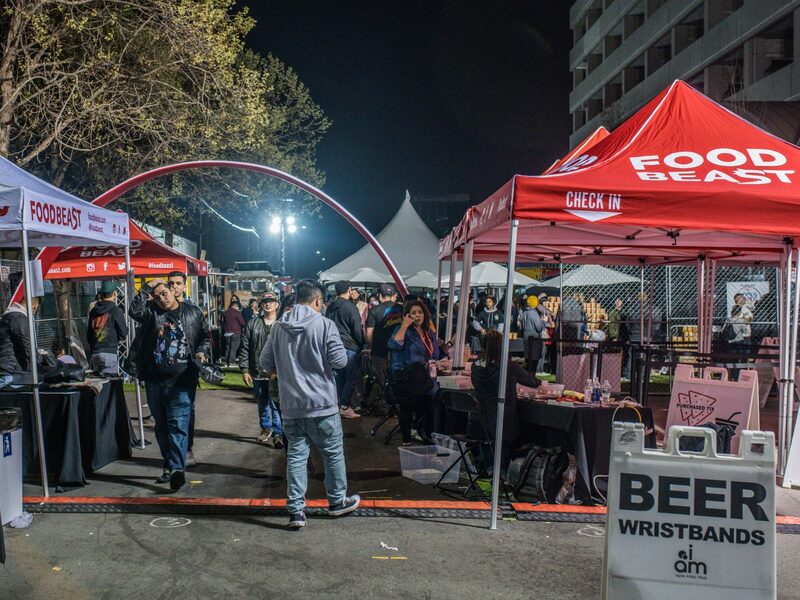 Located in the beautiful and scenic Jack London Square, the outdoor festival had two sections: the Marketplace, which boasted a bunch of food trucks from the area, and the AYCE section, which showcased special dishes from restaurants all over the bay. We didn’t come close to trying everything there, but we still got our fill of Asian noodly goodness and managed to squeeze in some photos before we devoured everything in sight, too. You buckled in? Let’s go! 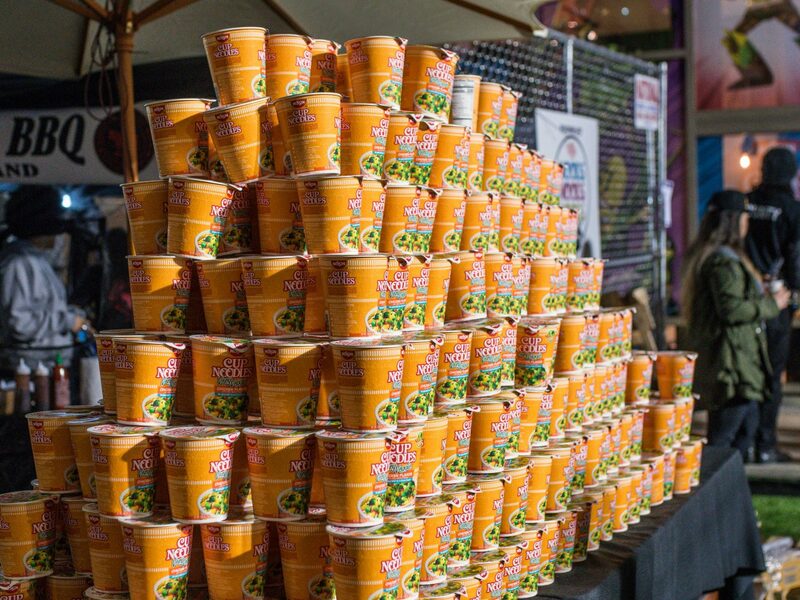 The first thing we saw on the way in was this awesome Tower o’ Cup Noodles display. You know you’re in the right place for a noodle festival when there’s a wall of noodles. To the right were several food trucks that had some drool-worthy dishes and tons of happy eaters flocked around them, but our main destination in Noods Noods Noods was the AYCE section off to the left of the entrance. And so we pointed and landed ourselves at our first tent, which was Farm House Kitchen Thai Cuisine! 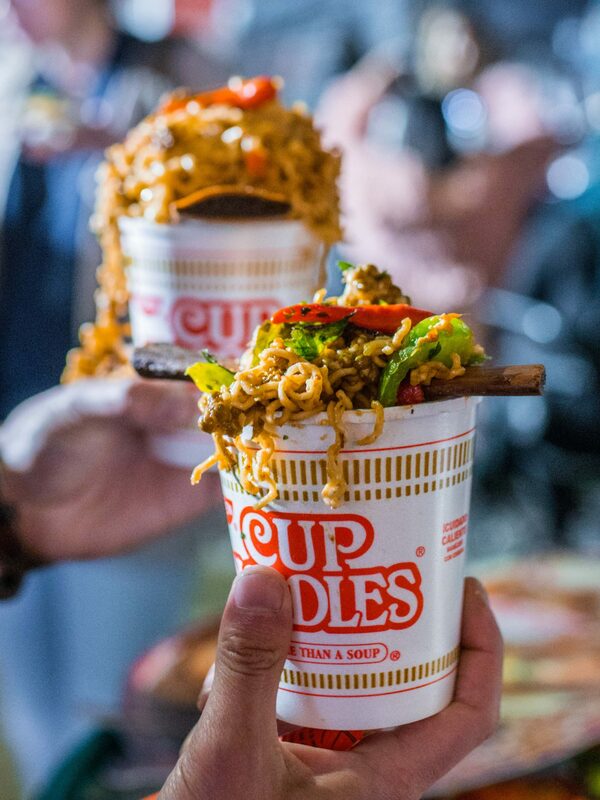 When we stepped up, we were greeted with an overflowing cup of their Volcano Dream Cup Noodles, which consisted of slow cooked beef rib, pan fried Cup Noodles, in spicy Thai devil sauce, bird’s eye chili, tamarinds, cumins, garlic, onion and cilantro. This was one hot way to start off our noodle journey! “Volcano” was definitely an appropriate name for this dish, and Noods Noods Noods is definitely the right place for it! It was super bomb! We definitely needed the reverse blow for this one though. Next up, we zig-zagged across and got in line for 808 Poke Shack’s Pop Rocks Marinated Poke, and it was off the chain! 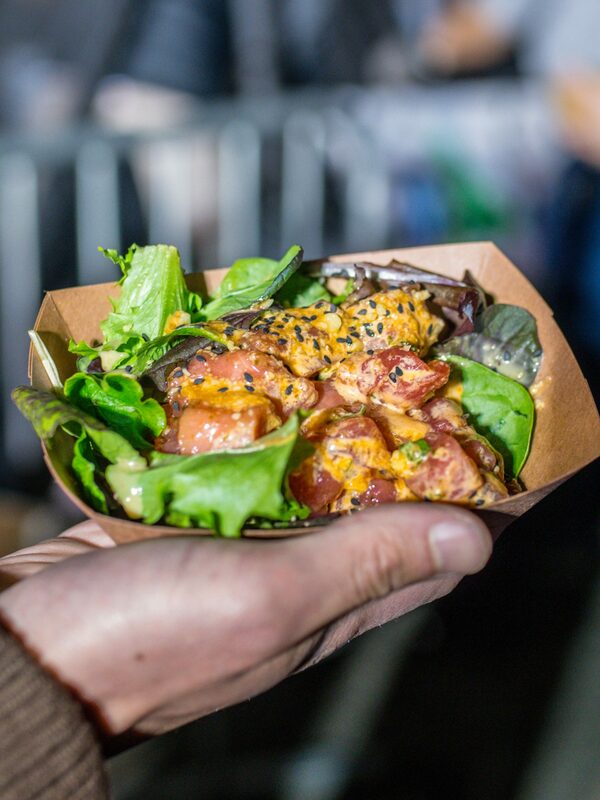 We sometimes get a tad nervous with things that seem a little gimmicky, but the flavor of the poke was awesome and not compromised at all, and the pop rocks were actually really fun! It was a blast from the past for both of us, who haven’t had Pop Rocks in years. We’re throwing this next shot in even though it wasn’t taken at Noods Noods Noods because we were extremely unfortunate, and by the time we got around to Aria Korean Tapas‘ stand, they had run out of food! 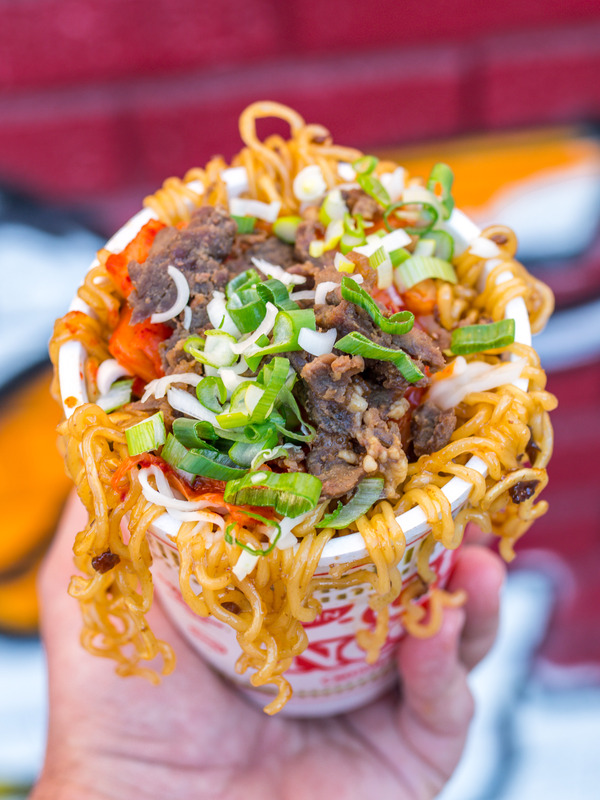 Luckily, we had the chance to snag a preview of their Bulgogi Stir Fry Ramen a few weeks before the festival and it was incredible. It’s prepared with bulgogi, ramen noodles, garlic, ginger, mozzarella cheese, stir fry kimchi, and a fried egg. Charlie, one of the founders and chefs at Aria, said they’re unsure about whether or not they’ll officially add this one to their menu, but our vote is a definite YES! 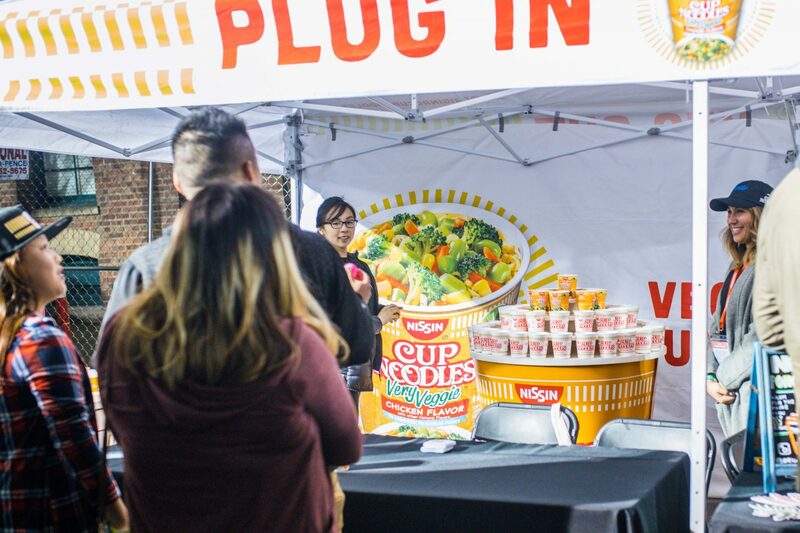 And, of course, what celebration of noodles would be complete without some Cup Noodles Pong?! Making our way around, the next two dishes were definitely some of the more experimental ones we tried. First was Bamboo Asia’s Chicken Tandoori Futomaki! 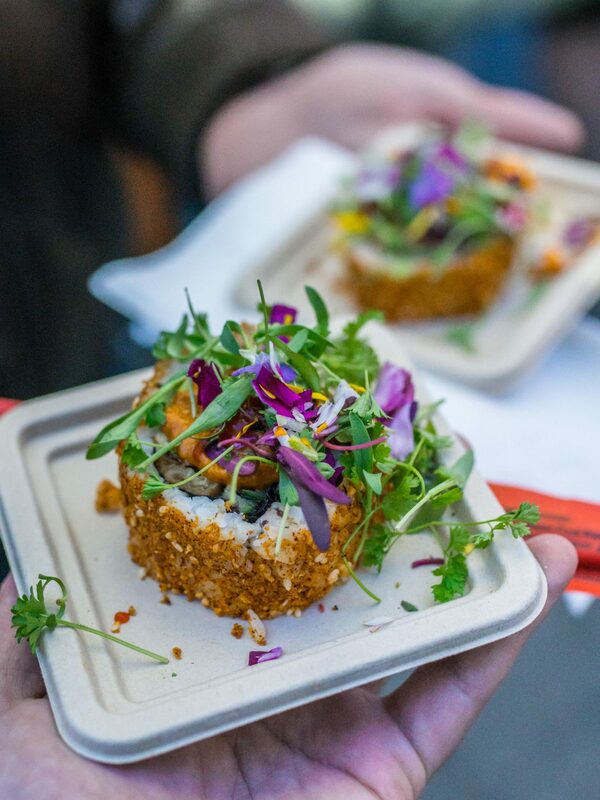 It’s made up of chicken tandoori, Delhi slaw, tomato chutney, sriracha, eggplant chips, avo, cilantro, and pickled cucumber, and wrapped in a sushi roll, and finally coated in a layer of their secret “Street Crack” Spice. 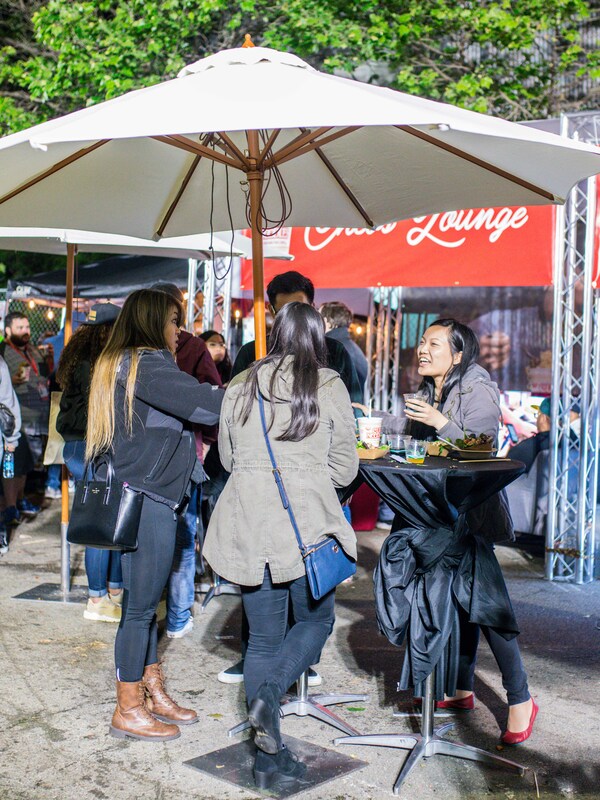 The people at the tent described it as a “perfect mix of Japanese and Indian flavors” and that’s definitely the best way to describe it! The sushi rice and seaweed were prepared in the Japanese way, and everything in the roll was very much Indian, which was a super unique experience. The other experimental dish we tried was K-Tea’s Chili Cheese Jian Bing. If you’ve never had a jian bing, you should. Straight up. It’s traditionally made as basically a large crepe with egg, green onions, sesame seeds, spices, crispy wontons, fish sauce and chili sauce, but K-Tea decided to bring the American influences in with their take on the classic Northern Chinese street breakfast. 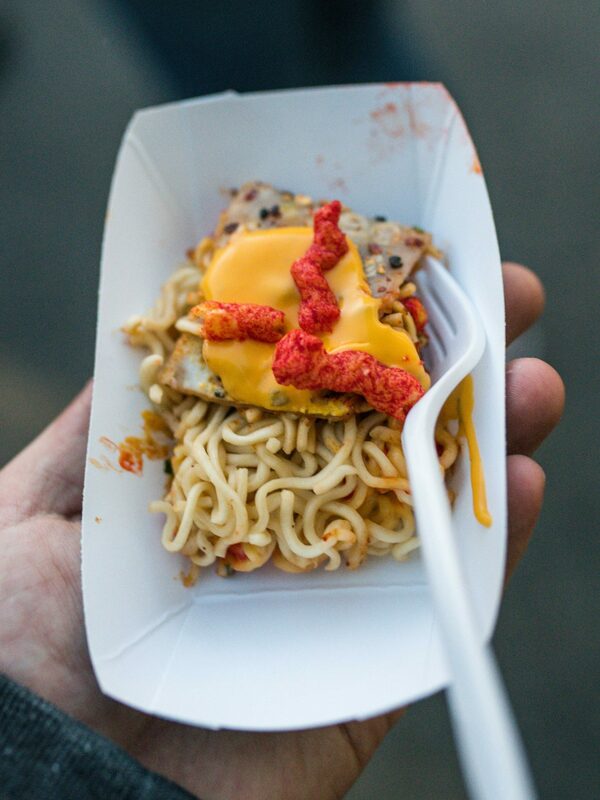 Instead of the usual ingredients on the inside, they threw in ramen noodles, nacho cheese, and, for some crunch, some Flamin’ Hot Cheetos. To finish off the night, we had two desserts. The first of which was the Mango Sticky Rice from Chick’n Rice. We had the pleasure of visiting their Berkeley location last year and trying their full-sized version, so we knew we were in for a treat! 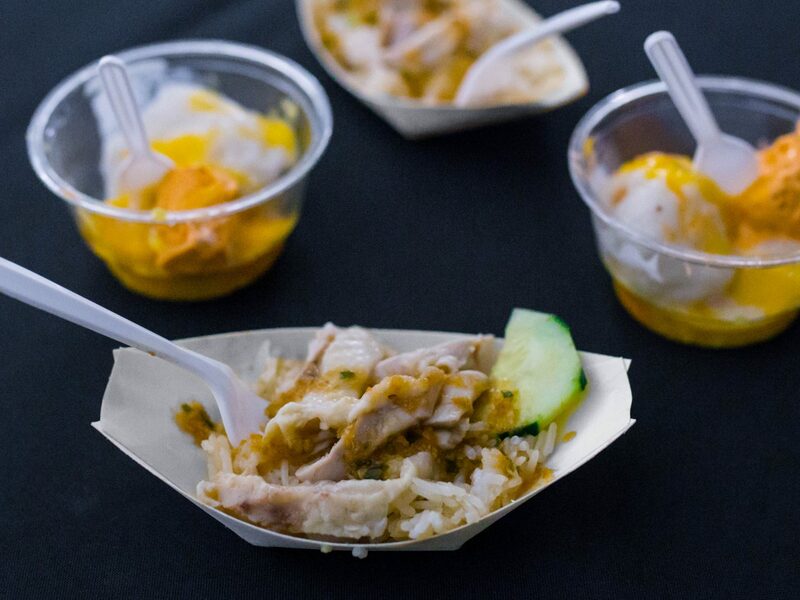 It consists of fresh mangoes, sticky rice, Thai tea ice cream, and a coconut reduction. Sticky rice in dessert is one of our favorite things, and this one definitely doesn’t disappoint! We also got to sample their Khao Mun Gai, which was bomb as usual! They just opened up a new location in San Jose, so if you live in the South Bay and you’re new to Chick’n Rice, check them out! SEE ALSO: Home SF: Incredible Brunch Round 2! Last, but definitely not least, we washed everything down with a cool Matcha Vanilla Swirl Shaved Ice from the brand new Matcha Cafe Maiko in SF! 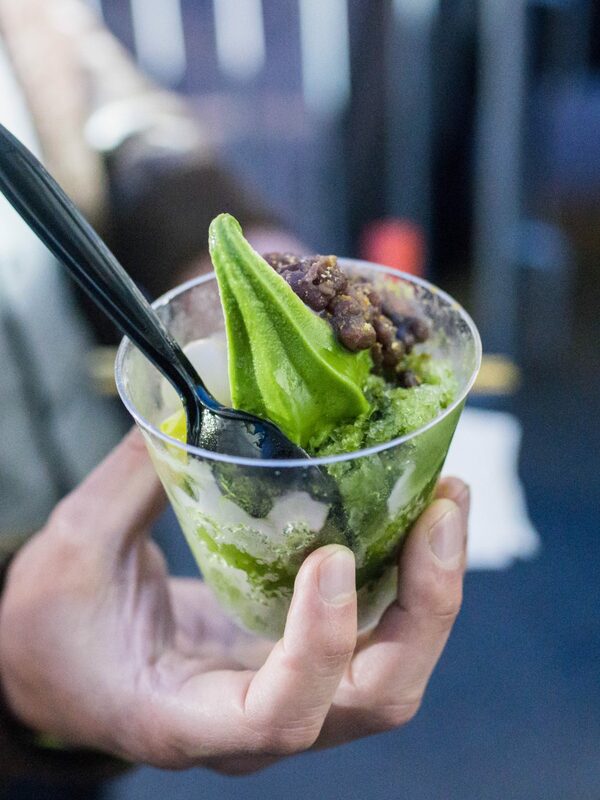 The dessert was made up of matcha and vanilla ice cream soft serve, topped with shaved ice, azuki beans, and mochi. Any fan of matcha NEEDS to try this. And the awesome, energetic owner saw that we were being handed a cup that was a little skimpy on the matcha syrup and shouted “Hold up! Where’s the green!? Let me help you with that!” and squirted a healthy amount into the shaved ice. And we are forever grateful! We had such an amazing time trying all the unique and nomtastic dishes all around Noods Noods Noods, and everyone around us had smiles on their faces and full bellies. 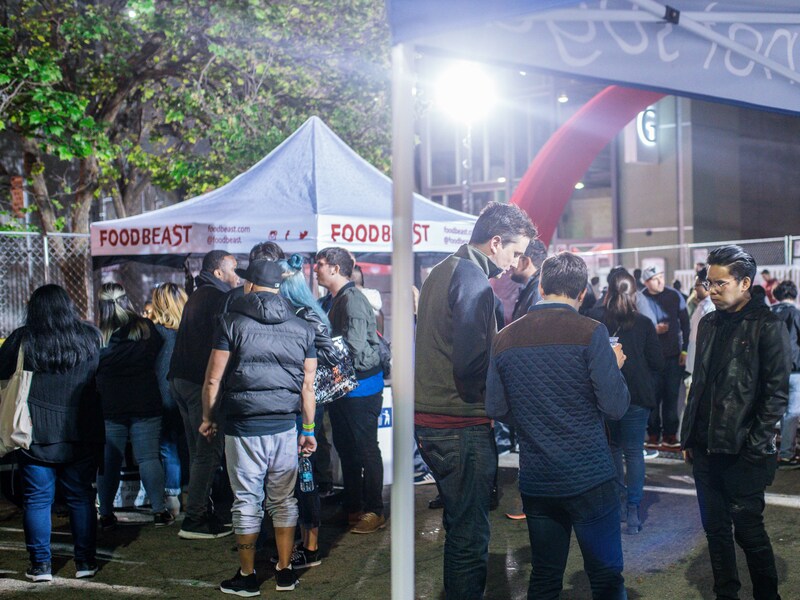 We loved how the food joints and the guests all came together as a community to progress the culinary art form and spread their love of noodles, and we definitely hope foodbeast decides to bring the noodle festival back to the Bay Area next year! Thanks again to foodbeast and Noods Noods Noods for the invite and we’ll definitely be back next time! Till next time, Nomsters! Previous Post Matcha Cafe Maiko: The First Matcha Cafe in SF!